Some household water needs more treatment than just softening especially if you have well water. See below for common problem water treatments. Aqua Systems has been treating problem water since 1959. Depending on the treatment needed, we build systems in a standard format with one treatment chamber, or as a multi-chambered unit to apply multiple treatments in the same system. Different problems require different treatments. Here are common treatments we apply and the problems they solve. For control of Iron, manganese, and low levels of hydrogen sulfide. The unique feature of this media is that it will both oxidize and remove iron. This media requires regeneration with potassium permanganate. For removal of iron and manganese in waters with a high level of dissolved oxygen. Birm works best when combined with air-injection to oxidize iron prior to entering the filter bed. This media is maintained by simple backwashing. For removal of particulates, and improvement of cloudy water. Filter Ag is also easily maintained by simple backwashing. For the removal of dissolved chemicals from municipal, or other chlorinated water supplies. With simple backwashing, activated carbon can provide years of trouble-free chemical removal. This media is especially effective at removing chlorine. Specially formulated carbon for the removal of chloramines, and higher levels of hydrogen sulfide. This media provides both a catalytic and an adsorptive reaction. Centaur is especially effective in applications where iron and sulphur are present, and is maintained by simple backwashing. 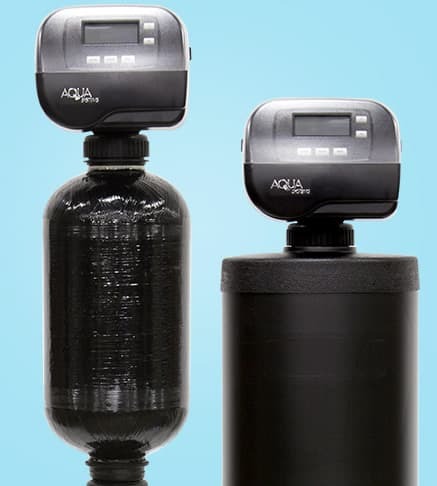 patented media that is excellent in removing Chlorine, Hydrogen Sulfide, and Iron. KDF also has a bacteriastatic quality that prohibits bacteria from growing in the media. This media is NSF certified to ANSI/NSF standard 61, and is maintained by simple backwashing. A mix of calcium carbonate and magnesium oxide can be used to correct low pH that can destroy plumbing fixtures. This media is maintained by simple backwashing, and over time, adding additional media is usually required. Tannins are organic compounds that cause discoloration of water. Tannins are removed by using an ion exchange (Tannin) media. This media requires salt to regenerate, but will not soften water. If Tannins are present in water along with hardness, a TN combo unit can be used. A TN combo unit uses both the Tannin resin and the standard Softening resin together in the same tank. Each resin is regenerated with salt. Contact an expert and we will help you treat your water so it’s safe to drink and use in your home.